Soulasana is inspired by the hope and dream that we can all feel soul expansion, lightness, health and joy through the practice of yoga, meditation and movement. We welcome our entire community, all experience levels and the idea that we can add more light to this world together by healing ourselves first. When we feel good in our bodies and in our minds and soul, we have more love to share. Soulasana means Soulful Asana, the Sanskrit word for posture. Here, we invite all styles of mindful movement, yogic schools of thought and studies of healing energy arts. We are students of life and hope to continue to manifest our dreams together in health and peace and love, engulfed in beautiful vibrancy, music and art along the way. There is no judgment in this space, only love and acceptance. Welcome home. We offer Reiki Circles the 2nd Wednesday of every month from 12-1pm led by Reiki Master Elizabeth Augustine. These circles are donation based and offer time and space for all of us to practice our healing work together in community. Our next scheduled Reiki Circle is Wednesday May 8 from 12-1pm. Kundalini is a school of yoga that is influenced by Shaktism and Tantra schools of Hinduism. It primarily uses a focus on awakening kundalini energy through regular practice of meditation, pranayama, chanting mantra and yoga asana. This class will begin with a vinyasa flow warm-up to heat the body and calm the mind and end with a kundalini kriya. A kriya is a practice of specific asana, breath work and sounds that affect the body, mind and spirit simultaneously. This energizing fast paced class will explore the elements of the Primary Series of Ashtanga Yoga. Mindfulness, breath, and bandha (internal subtle locks) and chanting will be explored along with asana (yoga postures) in this moving meditation. Be prepared to sweat! Ashtanga is a traditional method from the late yoga master Sri K Pattabhi Jois. Prior yoga experience preferred but not required. Enjoy a challenging flow class while various essential oils, specific to the practice at hand, are diffused in our practice room to elevate and heighten the yoga experience. The senses will be activated and then treated to a sound bath with quartz singing bowls and chakra meditation. This class will have you sweating and feeling completely detoxed and charged when you leave. A gentle and slow-paced practice with a therapeutic and nurturing energy. This class is good for recovery/healing, preventative care, and increasing flexibility for all ages. In this intermediate level class you will move through vinyasa flows slowly while intensified by mindfully holding postures for several breaths. You will build heat and strength and increase flexibility while deepening and advancing your practice, improving the mind-body connection. Power Flow is a journey for each student not just of the physical body through strong asana postures and flows but encompassing the subtle body through pranayama work. Laura combines good instruction and clear cues with assists throughout class while always remembering to never take herself too seriously. Working with both laughter and a deep love of yoga, this class is good for everybody. Yoga Sculpt utilizes a combination of yoga postures with traditional workout and plyometric moves to hep build strength, tone and sculpt specific muscle groups. This class is great for beginners as well as more advanced yogis looking to build up their strength and tone. A graceful journey from movement to stillness, balancing the physical, emotional and spiritual aspects of the Self. This powerful and gentle practice is designed to strengthen your body, purify your mind and nourish your soul. The modern teachings of Vinyasa and Yin are infused with ancient Vedic and Taoist principles, to awaken and harmonize the divine masculine and feminine energies residing within you. A candlelight slow paced yin class where we hold therapeutic and healing postures for longer periods of time to enjoy deeper relaxation and release. Enjoy a guided meditation to close the class before savasana (final relaxation pose). This vinyasa practice will slowly wake your body up through deep asana and concentration of the foundations of each pose. As you begin to wake up and get more into the practice, the flow will naturally gain tempo and organically add more strength and flexibility training. This is a complete and balanced flow class. Yogalates is a style that combines the benefits and movements from Yoga with the core strengthening and focus of mat pilates. Kaiut Yoga is primarily a floor class which focuses on working through chronic pain and injuries, general aches and stiffness, and work for the inflexible, hyper flexible and aging body. This class can benefit everyone. This practice is holistic, integrative, and deeply transformational and healing for all aspects of the human experience. It consists of pranayama – breath practices, kriyas – liberating movements with breath or mantra, Kundalini – practices working with our infinite potential of being, and meditative techniques. Once we activate our prana and energy, we move the body through asana, standing kriyas, shaking, or dance. Plan to go deep and rise high. The practice is rooted in the yogic teachings stemming from the Vedantic and Tantric traditions of the Himalayas. Each class is unique and infused with wisdom from the birthplace of yoga. No previous experience or understanding necessary, come as you are, and yoga will happen. Be ready to experience bliss, joy, and your most radiant Self! This intermediate level class is fast paced and will explore the elements of the Primary Series of Ashtanga Yoga. Breath, mindfulness, and chanting will be incorporated, along with asana (yoga postures) in this moving meditation. Be prepared to sweat! Ashtanga is a traditional method from the late yoga master Sri K Pattabhi Jois. Prior yoga experience preferred. One hour vinyasa flow class with a central focus on a specific chakra (one of our 7 energy points within the body) to heal, awaken, balance, nurture and stabilize our nervous system. The practice is deep and steady and focused and beautiful. Buti yoga means a secret remedy or cure. This high energy class combines jump training (plyometrics), tribal dancing and dynamic yoga asanas into an intense workout. Students will focus on linking conscious breath with a mindful flow. We will build strength, flexibility and concentration while cleansing the body and calming the mind. There is no AC used in this naturally heated vinyasa flow class, where we generate our own body heat and move through our sequences to a variety of different styles of modern, world, traditional, folk, electronic and downtempo music. Soul Flow means opening up our bodies and minds and spirits in a nurturing, loving, strong and compassionate way. The vinyasa flow weaves in and out of strengthening postures with long holds to more therapeutic releases and relaxing postures. We flow, we hold, we connect deeply with our breath and we practice self affirming loving affirmations and positive mantras to enhance and raise our vibrations, community, and expand our souls. All of us get caught up in our head, there is powerful medicine for this and it’s called Mantra. Naad Yoga or the Science of Sound is one of the easiest ways to change and uplift your vibration. Understand your power to get naturally high and intoxicated through sound medicine. Prepare to chant and enjoy some moving meditations. This class will incorporate pranayama, asana and meditation for our mama bears to connect with their bodies and spirits and growing baby during their prenatal journey. I have always loved yoga and been inspired by the powerful healing and joy that arises through practice. In 2005 I recieved my 200tt from Miami yoga Shala and in 2007 another 200tt from City Yoga in LA. Soulasana is the way that I am able to bring all my passions into one space; yoga, healing and movement, show my children that we can follow our heart at any age, and be a part of adding more love to our world. We are all journeying this planet together and my intention is to be a part of the vibration lift and the benefit of all. I hope you join our home here at Soulasana. Peace and Blessings - Namaste. Kate has been practicing yoga since 1984. She is a Certified Exercise Physiologist with The American College of Sports Medicine. She is also an experienced Corrective Exercise Specialist and Bodyworker. Vallia is an experienced yogini who studied Ashtanga Vinyasa yoga under several distinguished teachers including Nancy Gilgoff, a direct student of Sri K. Pattabhi Jois, and received trainings from Manju Jois, Lino Miele, and Jodi Blumstein. After traveling to India, Sri Lanka and Nepal, she expanded her teaching style to include Tantra Yoga, Yin Yoga, Hatha and a deeper understanding of the Chakra systems. Vallia’s classes will ground you in the ancient wisdom of the Vedic traditions where you will be immersed in a clear and concise instruction that will bring you into a more full and grounded practice. Kylie Cole is one of our most beloved Prenatal Womb Wisdom teachers on Maui and here at Soulasana. She has been practicing and teaching for over twenty years and brings her unique style influenced by her doula work, massage therapy practice, Chinese medicine and acupressure training and her personal spiritual and healing energy. Elizabeth loves Kundalini Flow and sharing what works to align energy. She loves to serve the heath of her global community and finds it brings great and rewarding JOY into her life. She used to own and run the beautiful Body of Light in Wailuku and now runs a small reiki and yoga studio devoted to healing and kundalini flow. She has been teaching yoga on Maui for over 20 years. Katya is divinely enlightened Kundalini Awakening / HATHA / Ashtanga / Vinyasa Flow yoga practitioner, teacher, Reiki Healer and spiritual jewelry maker. I came to Yoga 11 years ago seeking healing from a bulging disc and depression. What I have received goes beyond healing, Yoga transformed my life physically, mentally and spiritually. I put myself decidedly on the path of Yoga and healing. I went through Yoga teacher training at the Hatha Yoga Center of Seattle, and simultaneously got my BA in Mind-Body Health, focusing on Ayurveda, Mindfulness and Somatics. I then deepened my understanding of anatomy, healing touch, Chi Gung and Reiki through Maui School of Therapeutic Massage. I continue to seek new and inspiring teachings and have done courses in Kundalini Yoga, Pre-natal with Mark Stephens, Ayurveda with the Chopra Center and meditation at Thich Nhat Hanh’s Deer Park Monastery. My classes are holistically inspired, encouraging practices to expand consciousness and move stagnant energy, awakening your vibrant, infinite self. I offer hands on adjustments, to those wanting, to help you gain body-mind awareness and move from within. Join me in this uniting practice of Yoga, of being wholly you, with sweat, tears, laughter and profound peace. Corrin is a lead master Sattva Yoga Academy teacher/trainer, humanitarian, pediatric nurse and the founder of One Root Seven Branches, an integrated approach to healing. Corrin grew up in the U.S., but has been a global citizen for most of her life. She has a deeply compassionate heart and a longing to heal others. This fierce presence of love within her took her on a journey of serving as a pediatric nurse for eight years at Children’s Hospitals in the U.S., and, traveling throughout Africa and Nepal healing humans in small rural villages, before transitioning to a life of yogic living and healing. She went on a wild ride of her own health which lead her to study and teach the Vedantic and Tantric Himalayan Tradition of Sattva Yoga in India with Anand Mehrotra, world-renowned Master and founder of Sattva Yoga. Her life transformed rapidly as she integrated the wisdom that she longed for, through this incredibly balanced practice. She has been living in Rishikesh, India, the birthplaces of yoga, the last three years teaching at teacher trainings, retreats, and courses. Corrin is now in Maui part-time to share this sacred science. Teaching this technology of yoga as a healing and awakening remedy is the force that flows through Corrin with deep passion! Dani is from Brazil, a mom, and passionate about yoga. 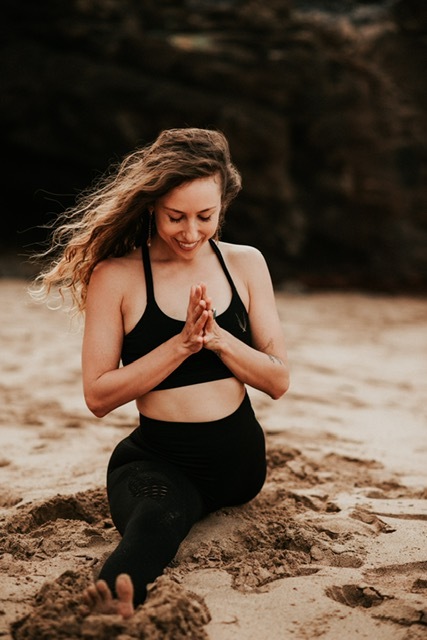 She loves to teach yoga in a way that is accessible to everyone and to create an atmosphere where everyone feels comfortable and feels the connection with themselves. You can find her on instagram @daniaguiar_personal_yoga. After practicing yoga on and off for years Megan Reece moved to Maui from Colorado and completed her 200hr yoga teacher training in 2015. Focusing mainly on Restorative style classes, she felt something was missing. In 2016 Megan was introduced to the Kaiut Yoga Method and in 2017 committed to the practice and study with the Founder, Francisco Kaiut. Bringing full awareness to our modern lifestyles and the way our body responds is key. "We live in a fast pace world, we need to take time to slow down and practice gratitude with every breath we take. Come join me on the mat, and together we can! " Kenny Ward has been a certified BUTI Yoga instructor since 2015. His classes are a music-driven, high-energy blend of yoga, dance, and plyometrics, and strive to leave you feeling good and loving yourself! Jaidah Terry, of Makawao, is originally from Illinois. She a free-lance ballerina with over 11 years experience in dance and fitness. She began choreographing at age 6, formally training in ballet,pointe, jazz,modern,and Yoga at 13, and began dancing professionally at 18. She trained with Peoria Ballet Academy, Ballet Chicago, American Ballet Theater, and Alonzo King’s Lines Program. Her professional experience includes dancing with The DanceWright Project, Labayen Dance SF, Peninsula Ballet Theater, David Herrera’s Performance Company, Copious Dance Theater, Naples Ballet, Man Dance Company, and The Quimera Dance Tribe, to name a few. She has a background in early childhood education, personal training, and energy work. Jaidah is a healer. Her knowledge and nurture combined create and environment destined for growth. Laura Jean Anderson is a certified vinyasa yoga instructor from the northwest corner of the USA. She travels the world helping people discover and grow their practice. 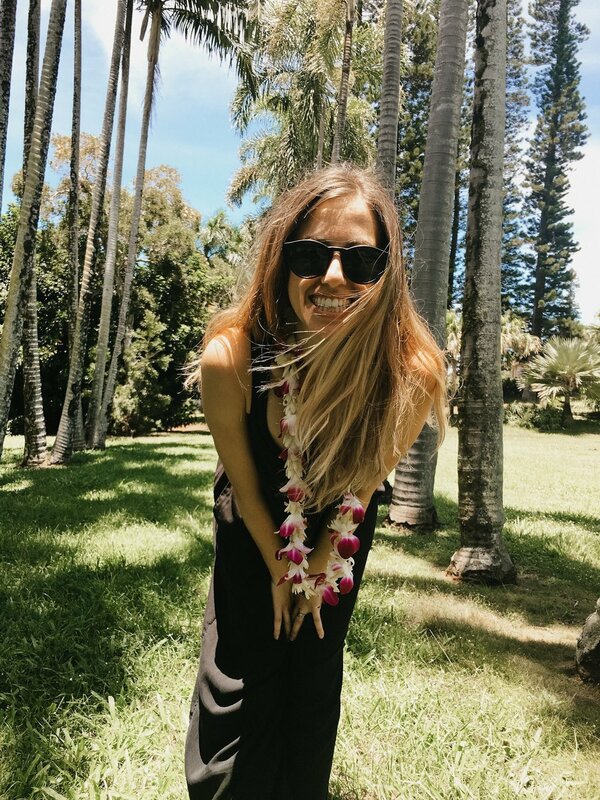 Certified in Vinyasa from Expand Yoga in Tacoma, WA, Laura has used her love of travel as an opportunity to seek out teachers and students of yoga all over the world. Her favorite thing is to share her love of teaching with her love of laughter to students of all levels. Niki has been E-RYT 300 hour instructor with a focus in Vinyasa and Yin. Yoga is truly my passion and has completely transformed my life. My deepest hope for each practice is to create both a comfortable and expressive space for each student to tap into their inner light and fully shine in their highest potential. Because of my Ashtanga Yogi mother and 10+ year personal practice, my teaching style ranges from gentle and restorative to vibrant and vigorous, depending on the pulse of the class. There’s a benefit to both styles; the Yin and the Yang sides of Yoga. Jill Devi Shri, E-200 RYT, RYT-500, YACEP is an International Yoga Teacher and Reiki Master Practitioner. Jill Devi Shri shares her passion with others through teaching yoga, meditation, workshops, retreats and yin yoga teacher trainings. Jill began her yoga practice in 1997. After several years of climbing the corporate ladder, Jill had an epiphany, which led to a change in her life’s direction. In 2014, her personal yoga practice led to her heart’s call to share this ancient wisdom. She completed her RYT-200 at Urban Yoga (Phx) and RYT-300 at Yandara Yoga Institute. She is also certified in the therapeutic styles of yoga: Pre/postnatal, Restorative and Nidra. Jill Devi Shri has extensive yin yoga training, which includes Bernie Clark's and Diana Batt's yin yoga teacher training in Vancouver, BC. In 2001, Jill’s close friend asked her to be her doula. Jill Devi Shri embraced the role of being an emotional, mental and physical support for her friend’s birthing experience. After witnessing this miracle Jill knew it was her calling to support other women during their pregnancy. Jill Devi Shri is a lifetime student and holds a BS in Business/Marketing and Project Management from University of Phoenix. Studio located around the corner from Whole Food towards the Maui Mall Theater on the left side. Copyright © Soulasana 2018 All rights reserved.